Access: The easiest route to Waitawheta Hut from Franklin Road is along the 7.5km historic tramway, through the spectacular Waitawheta Gorge. The tramway operated from 1898 to 1928 and has an interesting history. After an initial walk across farmland, the track is wide, reasonably flat and DoC has recently erected bridges across all but one river crossing. There is a bush track which can be used to avoid this last river crossing if needed. 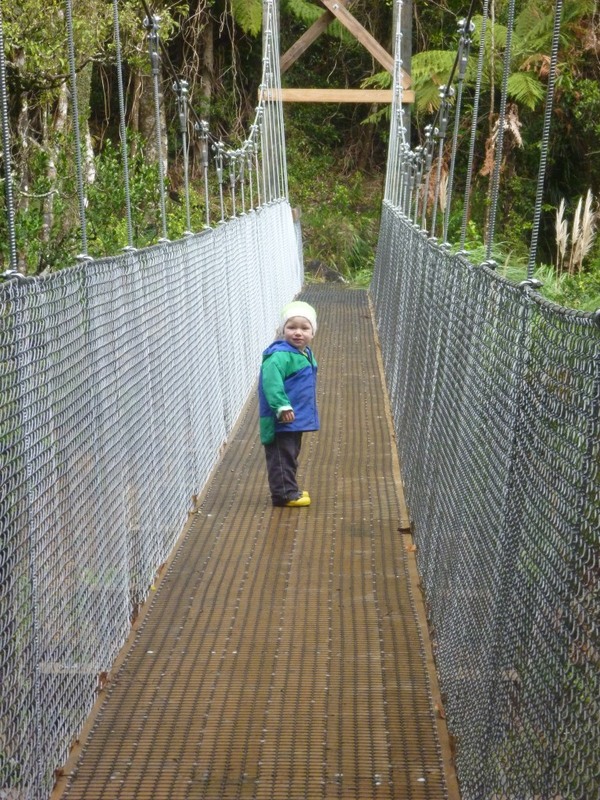 Our one and a half year old walked for at least two kilometres himself in both directions, and loved walking across the bridges. There are numerous relics and information signs along the way, particularly in the early sections of the track. One of the highlights of the walk is a replica log boogie carrying a huge log. There are various side tracks, such as the Bluff Stream Kauri Grove Track, which could be taken if you wanted to vary your route. We had stayed in Daly’s Clearing Hut the night before, and after half an hour steeply downhill we joined the tramway track. It was a further two and a half hours from the junction to Waitawheta Hut. Our return journey along the tramway took three hours. This track can be done at any time of year. Hut features: This is a new, serviced 26 bunk hut with two separate bunkrooms. It has a closed fire and firewood is provided. Inside there are tables with bench seats as well as a cooking area. There will be a hut warden most weekends during summer. There is a grassy area around the hut suitable for camping. The hut is located at the site of the mill cookhouse (a little further upstream than the original hut site). There are two short walks exploring the surrounds of the hut – the Miners Track and the Millers Track. In the evening, an easy five minute walk takes you some glow worms. There are also relics from the mill and cookhouse a short walk from the hut. Negatives: The hut is now part of the DoC booking system, and needs to be booked in advance. It is possible to use an annual hut pass, but you will need to ring the Tauranga DoC office to book. This hut is busy during the summer months.